While we're stuck with suffering through the unbelievably pathetic clown circus going on in Washington, there are actually things going on in other parts of the world. Turkey's military operation against Syria's Afrin region that we described yesterday has begun. Turkish warplanes have conducted hundreds of airstrikes at Kurdish YPG (People's Protection Units) targets in Afrin. Turkey-backed Free Syrian Army (FSA) militias are moving into Afrin to conduct the ground war. The FSA consists of Arabs and Turkmens opposed to the regime of Syria's president Bashar al-Assad. Russia says that it has moved its 300 or so troops out of Afrin to safety. Russia, which controls the airspace over Afrin, is not stopping Turkey's airstrikes, indicating that Russia is giving tacit approval to Turkey's operation. Turkey's own troops have not crossed the border into Syria, although there have been reports of trucks carrying Turkish tanks crossing the border to Afrin. Turkey would have no reason to commit its own troops unless the FSA troops started getting bogged down. 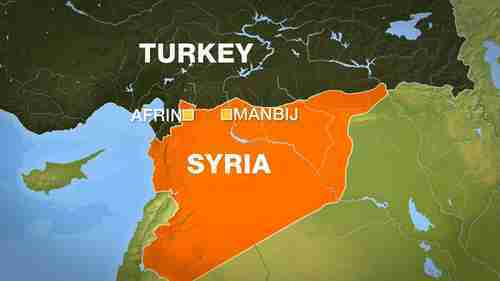 Turkey's president Recep Tayyip Erdogan says that the after Afrin the next target will be Manbij. Although Manbij is west of the Euphrates River Valley, there are American units in the region, so a clash with Americans would be a possibility, although it's likely that both sides would do everything to avoid it. "The promises made to us over Manbij were not kept. So nobody can object if we do what is necessary. Later we will, step by step, clear our country up to the Iraqi border from this terror filth that is trying to besiege our country." This refers to several American promises that were not kept. The Americans promised that the YPG would be armed and trained only until the so-called Islamic State (IS or ISIS or ISIL or Daesh) was defeated in Raqqa, but is continuing to arm and train YPG fighters for its Border Security Force (BSF). The Americans promised that they would withdraw as soon as ISIS was defeated, but now are saying that they will stay indefinitely, rather than risk repeating the blunder made with the 2011 withdrawal from Iraq. China has indisputable sovereignty over Huangyan Dao [Scarborough Shoal] and the adjacent waters." Lu Kang is a serial liar. Whether the subject is Doklam Plateau, the South China Sea, Taiwan, or North Korea, Lu Kang says any nonsense he wants, with no regard for the facts. China has no sovereignty whatsoever over the Scarborough Shoal. 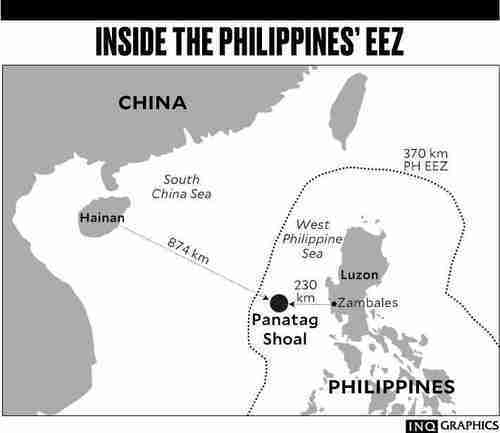 It's within the Exclusive Economic Zone (EEZ) of the Philippines, as shown by the above map. In 2016, Lu Kang and China were completely humiliated when United Nations Permanent Court of Arbitration in the Hague ruled that all of China's claims in the South China Sea were hoaxes and lies. Even the word "indisputable" is a lie on its face. Obviously China's claims are disputable, have been disputed, and have been shown to be false. Lu Kang is a serial liar. "The United States conducts routine and regular FONOPs [Freedom of Navigation Operations], as we have done in the past and will continue to do so in the future. We have a comprehensive FONOP program under which U.S. forces challenge excessive maritime claims across the globe to demonstrate our commitment to uphold the rights, freedoms and lawful uses of the sea and airspace guaranteed to all nations under international law. FONOPs are not about any one country, nor are they about making political statements. FONOPS are designed to comply with international law and not threaten the lawful security interest of coastal States." That the US simply ignores China's false claims in the South China Sea is undoubtedly very humiliating to the Chinese, who become infuriated whenever anyone challenges their false claims. The following is a summary of the major Generational Dynamics predictions that I've posted in the past. None of this is new, except that all of these predictions are listed together in one place. These predictions have been essentially unchanged for over ten years. The view that any nuclear war will kill all humanity, with the possible exception of some scattered small communities that move to sealed underground caves to escape the radiation. The Biblical end times: Parallels are drawn between today's events and the visions in Revelations, leading to the prediction that Jesus Christ will return soon. Albert Einstein: "I know not with what weapons World War III will be fought, but World War IV will be fought with sticks and stones." A new Dark Age, similar to the Dark Ages of Medieval times, characterized by centuries of ignorance and barbarism will begin. There will be a major global financial panic and crisis. As in 1929, there will be a quick recovery from the panic, but the crash will continue over a long period, with stock prices falling 90%. However, the trigger and timing of the panic cannot be predicted. The Mideast is headed for a major regional war, pitting Sunnis versus Shias, Jews versus Arabs, and various ethnic groups against each other. The world is headed for WW III, a Clash of Civilizations world war, in which the "axis" of China, Pakistan and the Sunni Muslim countries will be pitted against the "allies," the US, India, Russia, Iran and the West. There will be no Biblical end times outcome. A special mention must be made of Isaiah 17:1-3, which predicts the destruction of Damascus, turning it from a city into "a heap of ruins." Almost everyone in the Mideast seems to know about this prophecy, so if anyone ever nukes Damascus, it would be with the specific purpose and intent of fulfilling the prophecy, which would make it a self-fulfilling prophecy. By the end of the war, every nuclear weapon in the world will have been used on some target. However, this does not mean that everyone will be killed. The kill range of a nuclear weapon is 10-20 miles, even counting deaths from radiation, so only a tiny fraction of the world's population will be killed by nuclear weapons. A total of about 3-4 billion people will be killed by the war, from nuclear weapons, conventional weapons, ground war, marauding gangs, disease and starvation, leaving around 4 billion people to rebuild the world. At the end of the war, there will be an international conference in some place like Geneva to come up with a way to guarantee that nothing like this ever happens again. National boundaries will be redrawn as necessary. The United Nations will be restructured. Technology development will continue as before. Most of the world will be minimally but solidly rebuilt within five years. This will be a typical generational First Turning Recovery Era. The Singularity will occur around 2030. The future of the human race after that point is uncertain.